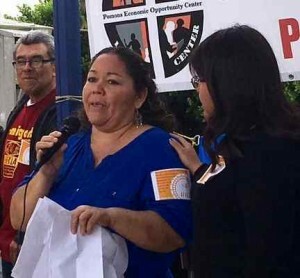 POMONA >> Domestic workers from the San Fernando Valley to San Bernardino gathered at the Pomona Economic Opportunity Center Friday afternoon to support a proposal that would make permanent overtime provisions for domestic workers set to expire next year. Senate Bill 1015, introduced by Sen. Connie Leyva, D-Chino, aims to keep the protections privately hired household workers such as nannies, childcare providers, caregivers, personal attendants, housekeepers and cooks are entitled to. The legislation went into effect Jan. 1, 2014 but sunsets Jan. 1, 2017. Most of those at the rally were women who work or have worked as domestic workers. San Bernardino resident Mireya Suarez was among those who spoke at the rally. Suarez was a domestic worker for nearly a year and now is active with the Coalition for Humane Immigrant Rights of Los Angeles. It’s work that is generally done by women and many times by immigrant women. The responsibilities domestic workers carry out are vital to society, Suarez said. “Because of that, it’s necessary to improve labor conditions,” she said. California has more than 300,000 domestic workers in private homes, according to a fact sheet on Leyva’s proposal. Los Angeles County alone has about 122,400 such workers, said Aquilina Versoza, executive director of the Pilipino Workers Center in Los Angeles. Terry Villasenor of Los Angeles works as a caregiver for an employer who values her work, she said. In the past, she said she worked 84 hours during seven-day weeks, she had no breaks and was paid a flat fee of $100 a week. Villasenor tried to recover overtime unsuccessfully but it wasn’t until she became involved with the Pilipino Workers Center that she learned about her rights. In her new work situation things are different. “I see beautiful things now. I don’t feel oppressed. I feel awesome,” she said. But not everyone is familiar with state regulations nor do they have someone to back them up, said Pomona resident Cruz Martinez, who is part of the Pomona Economic Opportunity Center’s Women Workers’ Program. Leyva’s legislation will allow domestic workers to have some protections. Leyva said making the provisions permanent in the bill called the 2016 Domestic Workers Bill of Rights, is not just about pay. “This is about dignity. This is about respect. This is about valuing all work,” Leyva said.